The Definitive Illinois Legal Malpractice Insurance Article - Sidebar Insurance Solutions, Inc. Most Attorneys practice law without fully understanding their legal malpractice insurance. After nearly 20 years and thousands of dollars in education, new law firms open their practices with the first policy thrown at them – or worse, with no insurance at all. This post (and the links included within) provide the information your law school professors didn’t tell you about protecting yourself, your firm and your clients. Legal malpractice insurance does not work like car or home insurance. The legal malpractice insurance policy structure is completely different at a fundamental level. Legal malpractice insurance is generally written with a claims-made form whereas other lines of insurance are written on an occurrence form. 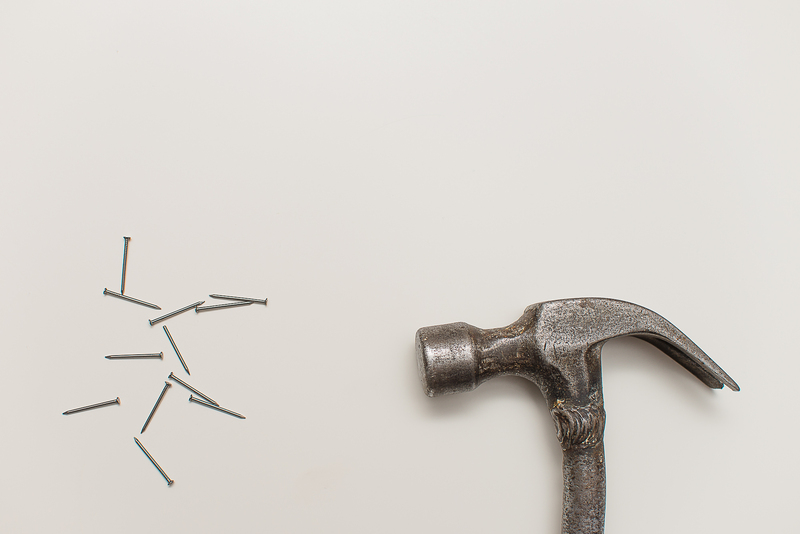 Misunderstanding the difference can leave your firm critically exposed. A standard home or auto insurance policy is usually written on an occurrence form. The policy’s terms clearly state an effective date and an expiration date. These dates serve as the bookends to the policy. If a covered loss occurs between the specific dates, the policy will respond to the claim. It is fairly straight-forward. Take the example below. An auto accident occurs during policy A. Even though the claim, suit, and trial all occur under Policy B or C, Policy A still governs the entirety of the claim. Unlike home and auto insurance, legal malpractice insurance is usually written on a “claims-made” form. A “claims-made” form considers three dates to determine coverage: 1. the effective date, 2. the expiration date and 3. the retroactive date. Any of three dates can jeopardize coverage. A legal malpractice policy’s effective date is the date when coverage begins. This date provides a bright-line after which the policy may respond to any claims the firm discovers (either by their own investigation or formal claim notice). Note: Knowledge of a potential claim will likely trigger an obligation to notify the carrier. Failure to notify timely can jeopardize coverage and future policy renewal. In short: Do not wait for an attorney to send a formal notice of claim – if you know there could be a claim, report it to your carrier as soon as possible. A policy’s expiration date is the last date that the firm can learn of a claim and be covered under the specific policy. If the firm does not learn of a claim prior to the expiration date, another policy (or its renewal) will likely have to cover the claim (provided the firm maintains its retroactive date – more on this later). 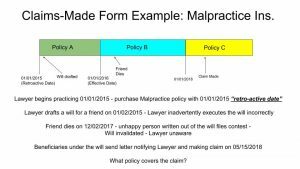 Often, a legal malpractice policy will provide an extended reporting period (ERP) after the expiration date to notify the carrier of a claim/mistake – but the claim/mistake may need be discovered prior to the expiration date. The ERP is merely a grace period to provide the carrier notice of claim. 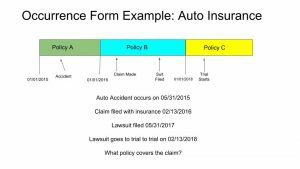 Under the example above, Policy C would respond to the claim – assuming the attorney maintained the 01/01/2015 retroactive date. Under the claims-made form, the policy in effect at the time the claim is discovered will dictate coverage. To read about how to protect yourself when moving to a new firm – click here. Note: Had the attorney assumed that Policy A covered this mistake and not purchases Policy C – he would have been without coverage. Coverage A expired without notice of the claim being made and therefore would not provide coverage. Read more here. The Endorsements: Policy Options can make a big difference! Aside from the claims-made form (which mostly has to do with dates), there are several other intricacies native to legal malpractice policies. These differences can provide enhanced coverages or put your personal and professional assets at risk. Before deciding on a policy, it is imperative that you evaluate the following options. Whenever a legal malpractice claim is made, the firm’s reputation is on the line. The public accusation of wrongdoing can spread rapidly among the legal community and the general public. As a result, most legal malpractice policies allow firms to have a say in whether to resolve a claim. This way, the insured has some control over the resolution that may have an effect on their firm’s reputational well-being. However, this power does not come without conditions. Most companies include a “Hammer Clause” in their policy. This condition provides that if the insured firm refuses to consent a settlement, any additional cost, expense or verdict will be the firm’s responsibility. This results in the firm putting up its own assets to stand for its reputation. For example, let’s say a firm refuses to consent to $100,000 settlement. 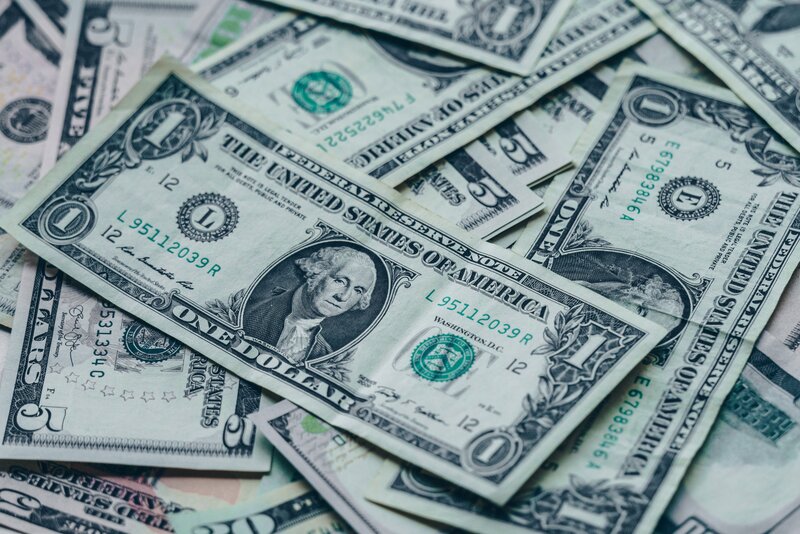 After which, the claim drags on for another year and ultimately results in a $300,000 verdict – the firm could be personally responsible for the additional $200,000 difference plus the costs of defense and investigation from the date of potential settlement and verdict. Some carriers even release themselves from their duty to insure altogether for refusal to consent to a recommended settlement. Either way, that’s a massive exposure. When evaluating coverage options, some carriers will offer to reduce or “soften” the hammer clause. This change results in the carrier and the insured share the additional costs incurred after the proposed settlement. If added, this usually done on a percentage basis. Other carriers may remove the clause altogether. All of these changes will result in an increased premium. Legal malpractice claims are expensive. They involve diligent investigations with specialized attorneys and expert witnesses. As a result, legal malpractice policies find ways to limit the insurer’s exposure. One such limitation allows the expenses incurred to investigate and/or defend the claim reduce the liability limit provided by the policy. This is called “claims expense inside of limits” or “eroding limits”. For example, let’s say a firm buys a legal malpractice policy that provides a liability limit of $500,000 per claim. On its face, this would mean the firm has half a million dollars to resolve any claim presented. However, if the claim investigation results in $100,000 in expenses, a claims expense inside of limits policy would only provide $400,000 to resolve the claim. Any additional amount needed to resolve the claim would be the firm’s responsibility. Depending on your area of practice, carriers may offer to provide a “claims expense outside the limits” endorsement. This will provide a specific limit (usually equal to the liability limit) to be used to cover investigation and defense expenses. The endorsement would require the investigation and defense funds to be used prior to any reduction in liability coverage. As previously discussed, a legal malpractice claim can have a significant impact on your firm’s reputation. It’s important that skilled and reputable attorneys are available to defend your firm. This particularly important to attorneys who often know the skill level an reputation of their colleagues. There may be attorneys you simply do not want defending you. Unfortunately, some insurance policies will not provide the firm any say in who protects the firm’s reputation. However, some legal malpractice policies will provide for mutual choice or allow you to select from a list of potential attorneys. It’s important to know policy’s attorney selection process when selecting your policy. Sometimes, a client files a claim against an innocent firm. But most un-endorsed legal malpractice policies require the insured firm to pay its deductible toward the expense of investigating the claim. Most firms rightly wonder why they should have to pay to defend itself against a client upset with the good work it has done? With the First Dollar Defense endorsement, if you won’t have to. Under the First Dollar Defense endorsement, the firm will pay its deductible at certain expense amount or at settlement/judgment. This way, the firm will not need to expend its own funds unless it truly did something wrong. Malpractice claims are one thing… but what about when a regulatory board investigation threatens an attorney’s license to practice law? These actions affect an attorney and their firm’s livelihood, earnings and reputation. For this reason, most legal malpractice policies will offer a specific line of coverage to help the attorney handle such an inquiry. Note that policies vary widely on the limits provided under this coverage. It is the firm’s best interest to weigh this coverage when selecting their malpractice carrier. Regulatory coverage is often provided on a reimbursement basis. Here, the firm will first pay for the defense andd then submit the invoice to the carrier for payment. When an attorney receives a subpoena regarding their client file, it presents a tricky scenario. Your client demands their attorney-client privilege. The Court demands respect for its authority and discovery tools. If you favor one of these competing interests over the other and a firm could find itself in trouble. This is why legal malpractice policies often contain specific limits to help an attorney appropriately respond to a subpoena while protecting their client’s interests. As with Regulatory Board Coverage, Subpoena coverage varies widely between policies. Attorneys should review this coverage before selecting their malpractice insurance. Honesty and trust must exist between partners in a law firm; nowhere more than in managing legal malpractice risks. Often, one partner is responsible for managing the legal malpractice insurance for a firm. But what if one of the partners does not disclose a potential claim or issue with their partners? And what if that partner is the one completing the malpractice applications? This very situation occurred in ISBA Mutual Ins. v. Law Office of Tuzzolino and Terpinas et. al. (2015 IL 117096). Here, one partner was responsible for a legal malpractice insurance. That same partner made a mistake that led to a malpractice claim. The mistake-making partner attempted to resolve the malpractice client and did not inform his partner or his malpractice carrier. While trying to dig out of the mistake, the mistake-making partner also completed the firm’s legal malpractice renewal application. The renewal application asked if the firm was aware of any claims or circumstances that could result in a claim – the partner answered “no”. Shortly after the renewal policy took effect, the firm received a notice of malpractice claim. In the end, the Illinois Supreme Court rescinded the malpractice policy because of the misleading application and denied malpractice coverage to either partner despite one partner’s innocence in the matter. The Innocent Partner clause provides the unaware partner(s) with defense and indemnification should another partner act in a way that invalidates the policy. You should note that this is often unavailable for small firms (less than 10 partners) – so it benefits all partners to maintain open and honest communications about potential issues that arise in their respective cases. 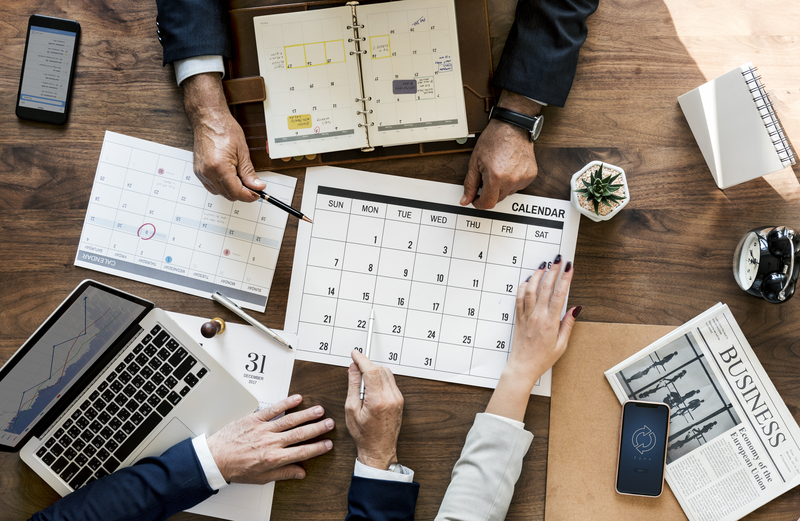 As discussed previously, legal malpractice policies often allow for a few extra days after the policy expires to present the claim. But what do you do when you shut down your firm or retire? The risk to your future lives on – even if you do not actively practice. The solution is to purchase a policy with an extended reporting period (ERP) also known as a tail. A tail policy allows an attorney or firm to present claims discovered after the expiration of the policy. This way, the carrier covers old mistakes that occurred prior before the attorney stopped practicing law. Note: A tail policy will not cover new mistakes made after the expiration date. It can not be used to cover someone in the active practice of law – but can be used to cover old mistakes while a new policy covers new mistakes. Read more about this here. Most carriers are now including a tail policy as a reward for being with a specific carrier for a certain number of years. If an attorney or firm is considering shutting down in the next five years – it is imperative to consider the tail options when selecting your legal malpractice coverage. 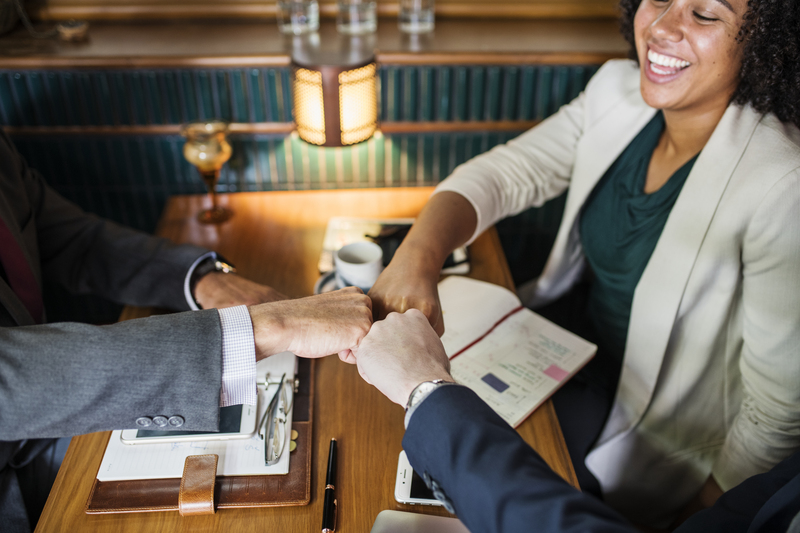 It is also possible for an individual attorney to purchase a personal tail policy, should that attorney have concerns about the prior firm maintaining the firm’s coverage. 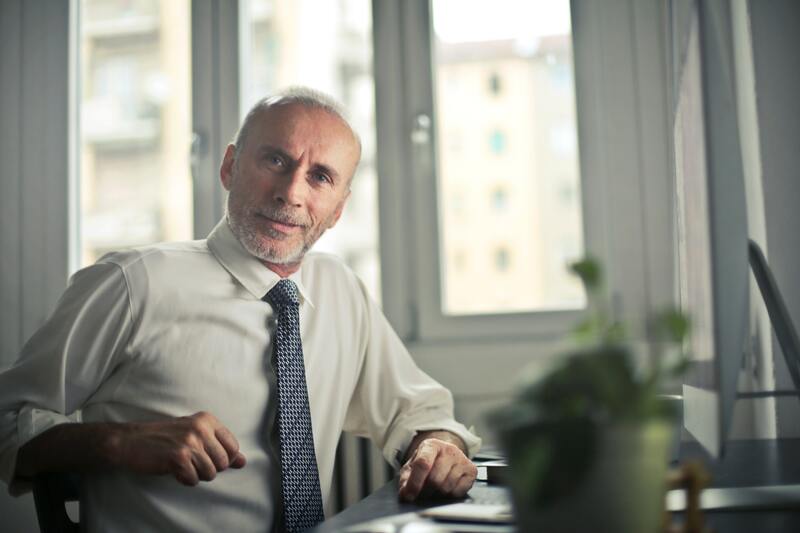 A firm may also purchase the personal tail coverage as a retirement gift or as part of a severance package for attorneys in a disbanding firm. The availability of said personal tail policy depends on the carrier the firm selects. Every legal malpractice policy application requires the firm to disclose its areas of practice. 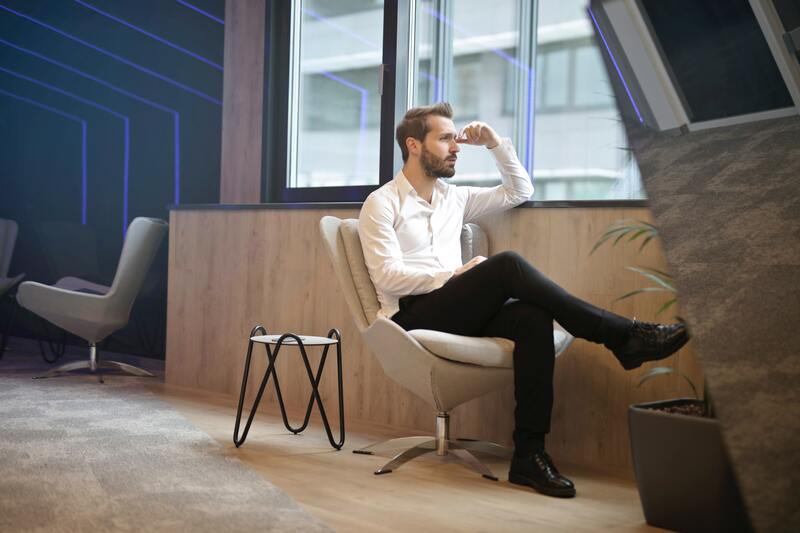 A firm’s practice areas are the most significant information underwriters consider when determining whether to insure a firm and how much to charge for the coverage. Failure to provide an accurate breakdown of the firm’s practice areas can be fatal to the firm’s malpractice policy. As a result, it is imperative that a firm update its areas of practice in order to protect its growth. Carriers can also provide suggestions for ways to better run and protect your firm as it moves into a new practice area. A legal malpractice carrier will have seen the pitfalls of nearly all areas of practice. Allow their expertise to help you avoid areas that are perilous as well as provide with advice on ways a firm can avoid claims. Legal Malpractice policies are full of issues that both imperil and protect a firm’s success. Nevertheless, selecting and maintaining malpractice insurance is essential to a firm’s stability and its professional responsibility to its clients. 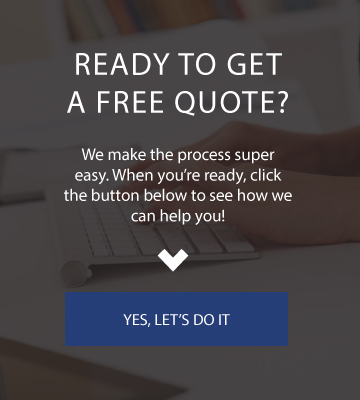 Sidebar Insurance provides all its customers with thorough and specific reviews of all the coverages and endorsements available to them through a robust portfolio of carriers. 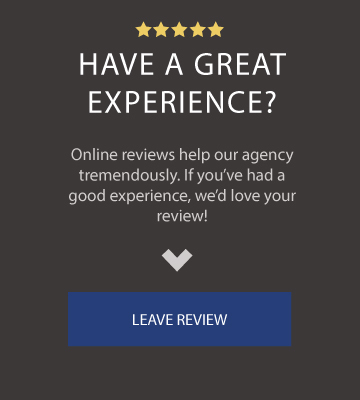 If you are ready to work with an agency that provides you with a voice and choice in your insurance… Let’s have a Sidebar! Adam Czerwinski is a life-long Chicagoan, married, father of two. In 2016, Adam created Sidebar Insurance Solutions to make sure families and business owners had a better understanding of how their insurance worked and ways that they can better protect the important things in their life. Through his agency, Adam hopes to provide everyone with confidence and peace of mind through insurance. Let Adam and his team know how they can best serve you and the people in your life! It is truly their passion. Previous Post: Our New Site! Next Post: How much home insurance should I buy?